We’ve been given the mission of going and making disciples (Matt. 28:19-20). If scheduling doesn’t leave people time for “going” with the Good News, how will people come to “believe in the one of whom they have not heard? And how can they hear without someone preaching to them? And how can anyone preach unless they are sent? As it is written: ‘How beautiful are the feet of those who bring good news! '” (Rom. 10:14-15). The word “preach” in the above verse goes beyond someone standing behind a pulpit giving a sermon. The word denotes openly proclaiming, or heralding — sharing the Good News of Jesus Christ which “is the power of God that brings salvation to everyone who believes” (Rom. 1:16). Proclaiming the Gospel goes beyond words. 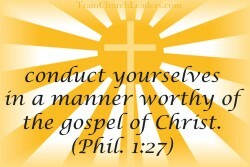 When, as believers, we conduct ourselves “in a manner worthy of the gospel of Christ” (Phil. 1:27), we’re demonstrating the power of the Gospel before others. We need to therefore keep the Gospel central, not by words alone, but in all we do. Hence, even our scheduling must be gospel-centered. How can we do scheduling in the church in a manner worthy of the Gospel? Look at other phrases in Philippians 1 about the Gospel. 1) In scheduling programs, think in terms of what will most “advance the gospel” (Phil. 1:12). If in scheduling programs, training events, staff meetings, and the like, we think in terms of maximum impact, then we shouldn’t be wasting people’s time. No one should be so boxed in that they have no time for going and making disciples. We need to be efficient and purposeful not only in what we schedule but also when we schedule it. 2) In scheduling people for ministry, think in terms of people serving together as opposed to scheduling individuals. We have a “partnership in the gospel” (Phil. 1:5) with one another. We should be “striving together as one for the faith of the gospel (Phil. 1:27). If in scheduling we think in terms of teams, then we shouldn’t need to over-schedule any one individual. No one person should be expected to do it all. We need to be strategic in getting people to support one another through the way we do scheduling. Gospel-centered scheduling leads to the most efficient, purposeful, and strategic programming and use of people’s time and talents. That’s freeing and empowering, providing an example for people to “go” and make disciples in their everyday living. This entry was posted in Scheduling . Next → Next post: Best Person to Do Staff Evaluations?